The Welte Light-Tone was one of the last instruments designed by Edwin Welte (1876-1958) of the famous Welte-Mignon mechanical instrument manufacturers. 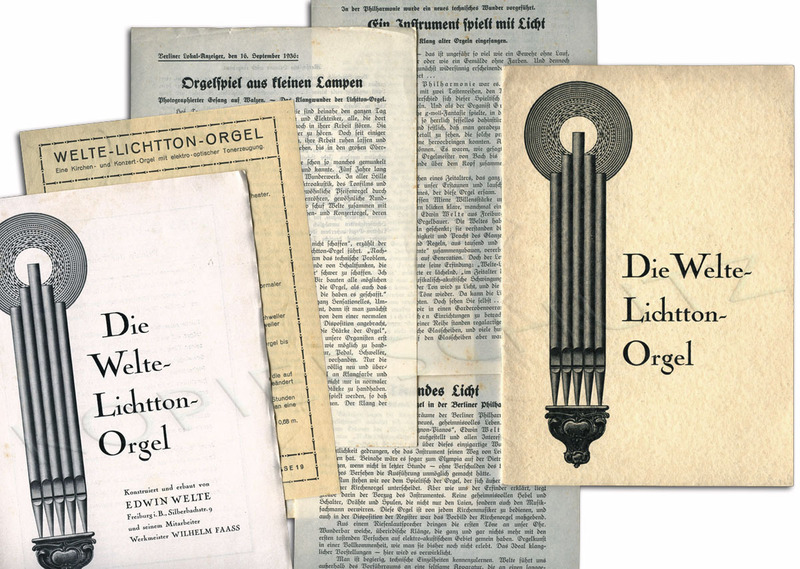 Welte had become fascinated with the possibility of using optical disks since 1925 and produced a number of prototypes using clay optical disks before completing the glass-disk based production version of the Lichttonorgel. 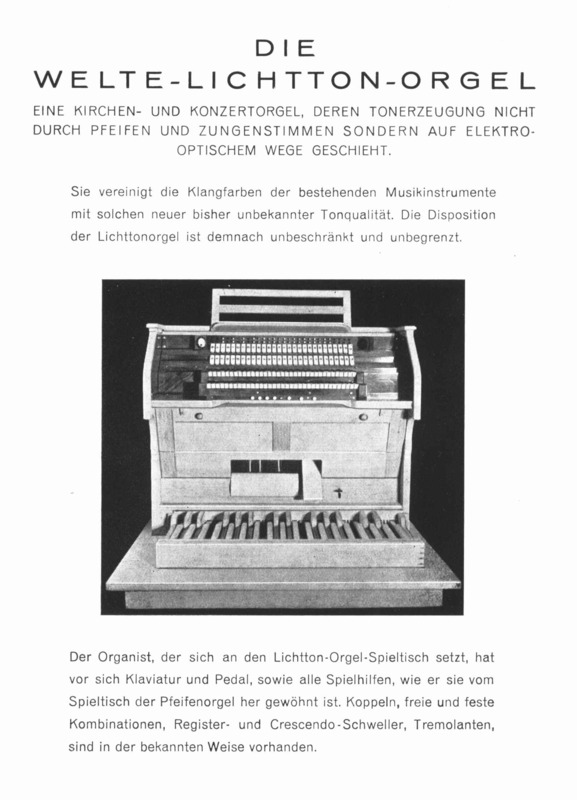 The sounds of the Lichttonorgel consisted of photographically drawn ‘recordings’ of different models of famous organs of the day but in theory could play back any recording of any instrument. 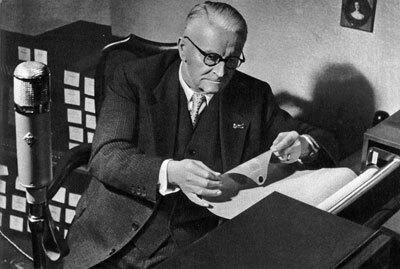 The organ premiered on November 6th 1936 at the Berlin philharmonic played by the virtuoso German organist Kurt Grosse and received enthusiastic review from the National Socialist newspaper the Völkische Beobachter (9. November 1936) “ A unique miracle, perfection in the entire realm of concert instruments” and speculated that it would be a perfect instrument for National Socialist rallies – on the strength of this endorsment, The German Telefunken comany negotiated a production deal. Any potential the instrument had was destroyed by the Nazi’s discovery of Welte’s marriage to a German Jew and Telefunken’s immediate withdrawal of their contract. After the war Welte continued to try and make a commercial success of the instrument but eventually foundered due to the complexity of the photo-electric system and from increasing competition from cheaper and more efficient instruments such as the Hammond Organ. Welte. Only three production models of the Lichtonorgel were completed. 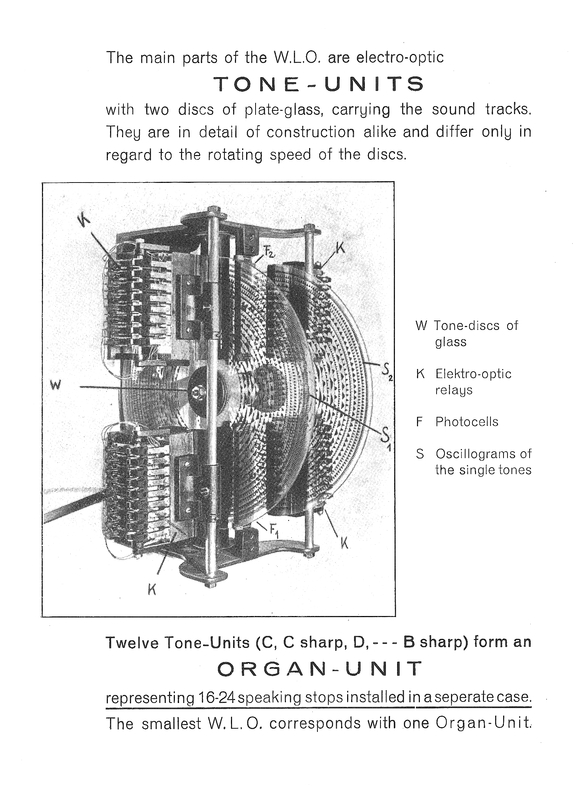 A detail of one of the the Light Tone Organ’s glass disks. 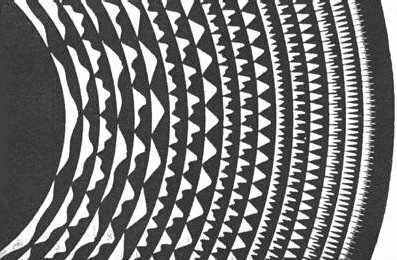 The instruments sound generation unit consisted of 12 glass disks which were printed with 18 different looped waveforms in concentric rings. 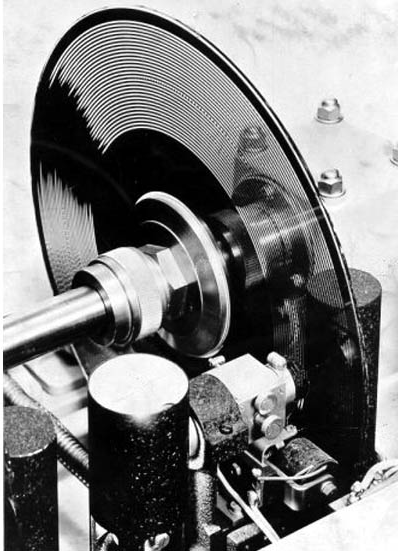 The glass ‘tone wheel’ disks were rotated over a series of photoelectric cells, filtering a light beam that controlled the sound timbre and pitch. The resulting combinations of tones gave 3 different timbres for all the octave registers of each note on the keyboard. The German arm of the Welte-Mignon company in Frieburg was completely destroyed in 1944 by allied bombing and all of the companies closely kept secret designs were lost forever. 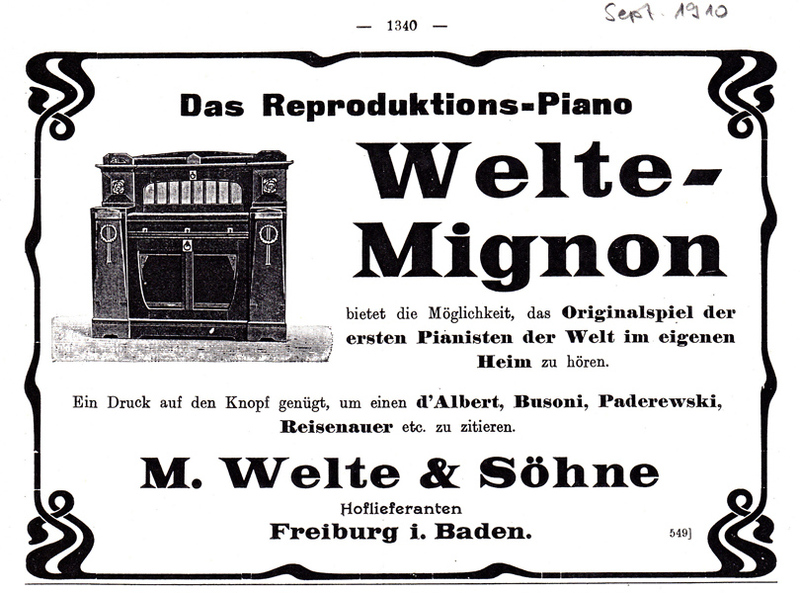 Edwin Welte (1876-1958) and his brother-in-law, Karl Bockish, developed the Welte-Mignon reproducing piano in 1904 for M. Welte & Soehne of Freiburg, Germany. Music roll recording commenced in 1905. The recording piano and the reproducing system were entirely new inventions which astounded the musicians and fans in Europe. In 1906 (?) he established “The Welte Artistic Player Piano Company” in a showroom in New York and soon was producing pianos and music rolls for American customers. The Welte Company was a German organ firm which was first established in 1832 at Vörenbach (Black-Forest) by automata manufacturer Michael Welte (1807-1880). 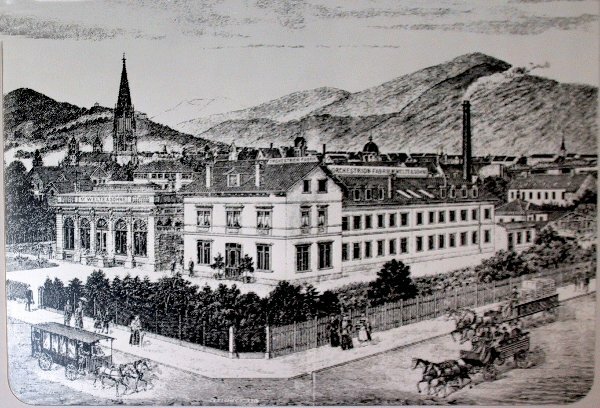 In c1865 he moved to Freiburg/Breisgau and the firm was registered there as M. Welte & Söhne. During the remainder of the 19th century the Welte firm expanded considerably and became particularly noted for their orchestrions. Welte’s “Cabinet player”, a reproducing piano without keyboard which bore the Mignon label, was first patented in 1904 while the firm was under the direction of Edwin Welte (1876-1958, grandson of the founder). The prototype was exhibited during late 1904 in Leipzig and became commercially available from early 1905. The Vorsetzer came on the market in 1908. Mignon was integrated into their upright pianos in 1909, and into their grand pianos from 1913. In 1908 the technology was adapted and applied to the Welte “Philharmonic Autograph Organ”. This was the forerunner of the “Welte-Philharmonie Organ” which was first publicly displayed at the Turin Exhibition of 1911. 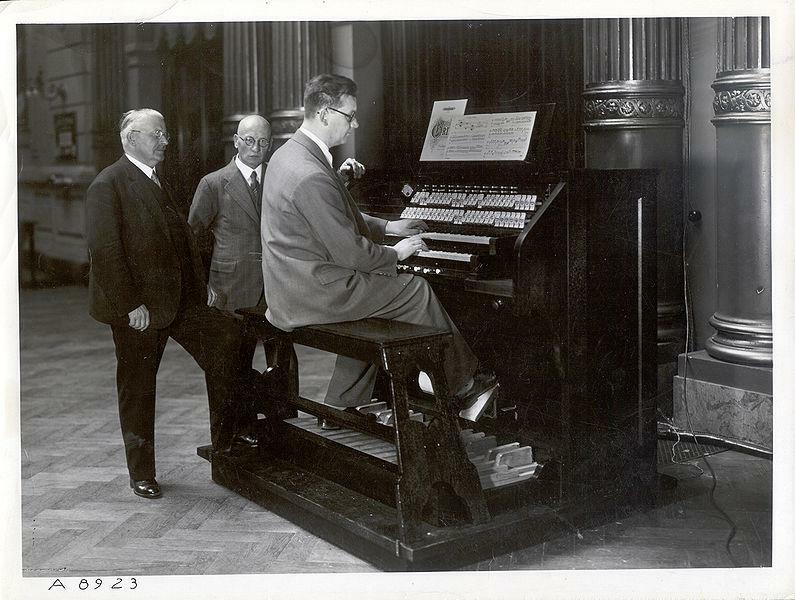 The firm then went on to successfully market player organs, cinema organs and, later, when their market contracted during the 1930s, church organs. They concurrently produced rolls of performances by the greatest organists of the day and sold them with considerable commercial success. From 1865-1917 they also ran a branch in New York (M. Welte & Sons) under Emil Welte (1841-1923, eldest son of the founder), but it was closed during World War I as an “alien enterprise”. Welte’s instruments became status symbols and the epitome of entertainment in their day. They were installed in stately houses, palaces, schools, department stores (Harrods in London had one), yachts, ships (one was manufactured just too late to be aboard the Titanic) and even apparently a “house of pleasure” (the Atlantic Garden orchestrion). Around the world they were dispersed throughout Europe, USA, with their market is known to have extended much further – to Istanbul, Russia, China and Sumatra for example. The top of Welte’s Orchestrion/player-organ range was the “Welte-Philharmonie”. Very few of the full- sized model were ever manufactured. From about 1926 Welte began to be threatened by a rapidly growing radio and recording industry. Business declined so much that, in 1932 they narrowly escaped bankruptcy. At about this time they were also involved in a collaboration with the Telefunken Company which was terminated because Edwin Welte’s first wife, Betty Dreyfuss, was Jewish. Due to the complex structure of sounds made by pipes, organs which simulated with sound generators and filters the sound of pipe organs never sounded convincing. Welte avoided this problem by recording real pipes and replaying these samples. He was years ahead of his time. Most modern digital organs do the same thing. The main difference is that Welte stored samples on rotating glass discs and digital organs use solid state storage for the pipe samples. Edwin Welte was a very clever inventor. He died in 1958 when electronic organs became popular in jazz and pop music. The Lichtton-Orgel could have been enormously successful due to its more realistic sounds.